Sports Psychology Expert & Award-Winning Parenting Writer Reveal Top Mental Game Strategies To Improve Kids’ Success in Sports! How one mental game change boosts self-confidence fast. How athletes can cope with frustration and let go of mistakes. How to help athletes take practice skills to competition. 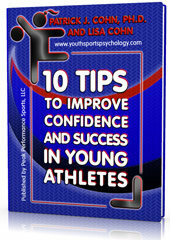 How young athletes can focus well under pressure. Why athletes perform tentatively or cautiously in competition. How you can overcome the top 5 “costly” sports parenting traps.